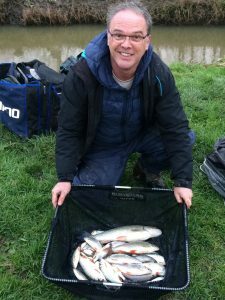 I’ve said it many times on this blog, in all the years I’ve fished this league (under many guises, the Zanussi, Hotpoint and Hollowlegs amongst others), I’ve only ever won it once and would dearly love to win it again. Well this seasons campaign got off to a disappointing start, stuttered in the middle and is tailing off as we reach its climax! Saying that, it’s the closest league in years and although winning it would be unrealistic, with just four points separating the top six, a top three finish is still within reach. After no rain all week, it then typically chucked it down on Friday and when I went down to look at it on Saturday it was practically unfishable, with no rain of any consequence forecast for the rest of the weekend, it would be touch or go. Waking up Sunday morning it didn’t look like we’d had much rain in the night and I’d just got to the bowling club when Langport Invader, Baz Morgan, turned up. 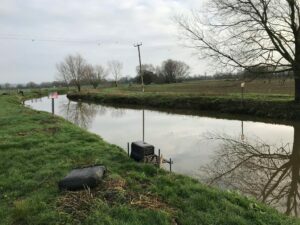 He said he’d stopped at Hambridge for a look on his way over and although it was high, it was fishable and should fine down during the day and to be honest with the pond not fishing great, I think most people would rather take their chances on the river anyway. With fifteen anglers booked in, the next problem was where to put everyone! We managed to get everyone in at Redbridge, Isle Brewers and Hambridge with a couple of new-ish pegs, 113 at Redbridge which looked nice and the choice of H8 or H10 at Hambridge with the latter, a peg I’ve fancied since we first looked at it. I announced the draw and everybody was hoping for pegs H5 or 125 which have won the last few matches. As Frank was holding the bucket, I got in the queue and actually managed to draw fairly early for once, I looked at the ball and I was on 112 at Redbridge, even though it had blanked in the last V.E.S. match, I wasn’t too disappointed as Steve P had lost several fish that day. I was on 109 that match and bizarrely, Steve had drawn it today and that’s now three matches on the trot we’ve been next to each other so at least I’d be able to keep an eye on him regarding the pound side bet. The top four in the league had a mixture of draws, Rob was on 129, Digger had 120, Jake had H6 and Terry was on 124a, no real fliers and Digger probably had the best of the bunch but it’s tailed off in recent matches. As for the two pegs everyone had wanted, Ben Simmonds drew H5 and Fieldy was on 125 which was the last ball in the bucket! I parked up at Redbridge and as I took my kit to the river I was hoping it wouldn’t be pushing through too hard but it actually looked gorgeous and as we walked to our pegs, several fish topped which prompted me to get a bit excited and say it would fish it’s head off! It looked like my peg had been fished recently as there were two tea bags on the ground! I set up a 1.5 gram DH13 to fish down the middle of the peg and a 1 gram bodied float to fish across to the far side where the flow was bit steadier. On the side tray I had a pint and a half of casters, half a pint of bronze and red maggots plus some Bait-Tech Super Seed hemp. I was ready with 15 minutes to spare so had a quick coffee (anybody recommend a decent flask, mine’s crap!) and then walked down to see Leighton on 113 which looked very similar to mine with a little tree on the far bank. Just before the off, I walked up to see Steve and then as I sat back on my box, it was time to shout the all in. I started with the heavier rig down the middle at 8.5 metres with double red maggot on the hook. I fed some hemp and casters upstream and also across to the far bank, I inched the float through with the flow and then held it back, a positive bite resulted in a little roach and then I had another next chuck, followed by a gudgeon and it felt like there were a few fish there. After an hour I had 12 fish which probably wouldn’t weigh a pound so I tried a caster to see if I could get some better fish but I only had one roach and missed a couple of bites. Back on double maggot I had a couple more roach and a dace and then hooked a better fish which turned out to be a chublet around 12oz and I was hoping his big brother would show at some point! I know there are some good chub in the peg as a few have been caught and several lost! Leighton shouted up that he hadn’t had a bite yet and not long after Steve wandered down and said he’d only had minnows so I was doing okay at this early stage. 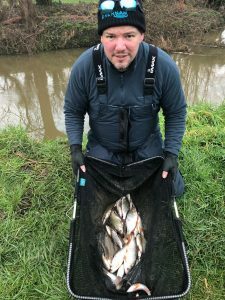 The second hour was steady with some more roach, a gudgeon and another chublet and although I wasn’t bagging, I was enjoying myself but felt sure I’d need some big chub if I was going to do any good today. 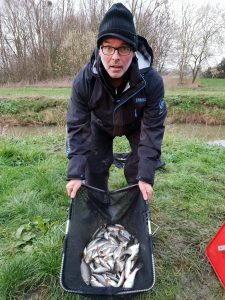 Leighton shouted up to say he’d had a small roach to get off the mark and that he’d spoken to Rob who said they were struggling at Isle Brewers, although I was sure somebody would be getting a few down there. I was getting the odd minnow on maggot so kept trying caster but it was slow going and I only had a couple of roach on it. Going into the third hour, my catch rate was still ticking over with some small roach and a couple of gudgeon but I was itching to try the far side where I’d been feeding hemp and caster since the start. I went across at 11 metres with caster on the hook but it was a bit of an anti-climax and I only had one slightly better roach, I stuck another section on and went tight to the far bank and searched further down the peg and had another roach and then a better fish which was a nice dace of 8oz or so but it wasn’t really happening. Back down the middle and the rest had done it some good as I had a nice little run of fish including a chub of around a pound. I also struck at a bite and it was solid before it started moving and I was sure I’d hooked a big perch but it turned out to be a 4oz dace foulhooked in the tail! It was still most welcome though as I reversed it into the landing net! 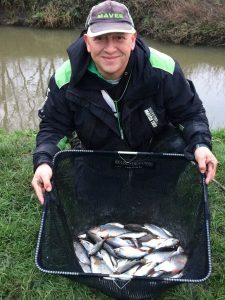 With around an hour left, bites dried up again so I stuck on another section and had another little burst of fish including my fourth chublet and some lovely dace around 8oz apiece although I also bumped one. I’d seen Steve net a decent fish but Leighton had called it a day. Just when I thought I was going to finish on a flourish, I didn’t had a fish for the last ten minutes. My final tally was 48 roach, dace, chublets and gudgeon plus a few minnows which I thought might go 6-7lb but I didn’t think it would do any good today. Steve had the scales and as we walked down to weigh Digger in first, I asked how many chub he’d had and he said one plus a few small roach for about 4lb but he was being a bit coy and I thought he might be telling porkies again. 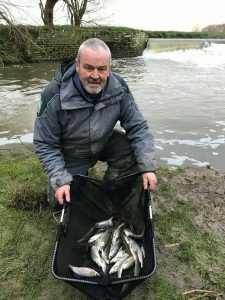 We got to the weir pool and I have to say it didn’t look great with the water hammering out of the tail of the swim and it was churning up and a tad too pacy really, he’d caught some nice roach and dace and weighed 6lb exactly. 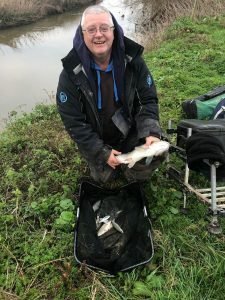 I was next and it was a little more than I thought as Steve called it at 8lb 5oz, then we walked up to weigh him in and yes he did have one nice chub of around 3lb but he’d neglected to tell us about the other two smaller ones – naughty boy! The needle pulled round to 6lb 12oz so he had to pay me a pound although it could have been a different story as he’d lost two big chub which could cost him today. As we headed back to the cars there were fish topping in peg 108 and in hindsight I reckon it would have done well today. Back at the results and the mega weights I’d predicted hadn’t materialised although it had still fished really well considering there was just a bit too much water on it lower down and it hadn’t dropped as much as expected during the day. 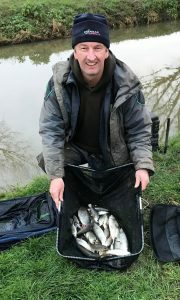 Fieldy had done well on 125 to win with 12lb 12oz of mainly roach, Frank was second with 10lb 1oz of roach from 126 and Terry ‘The Toast’ just pipped me with 8lb 8oz from 124a. 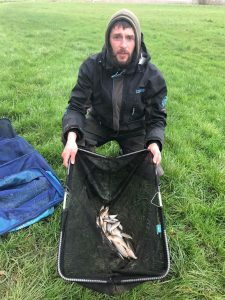 I thought I’d pick up the section money as I’d said in the morning we were paying the top three but when I checked the payout table that Rob put together, when it’s 14 anglers or more we actually pay the top four – result! Thanks to Terry Morgan* and Leighton Cox** for the photos. 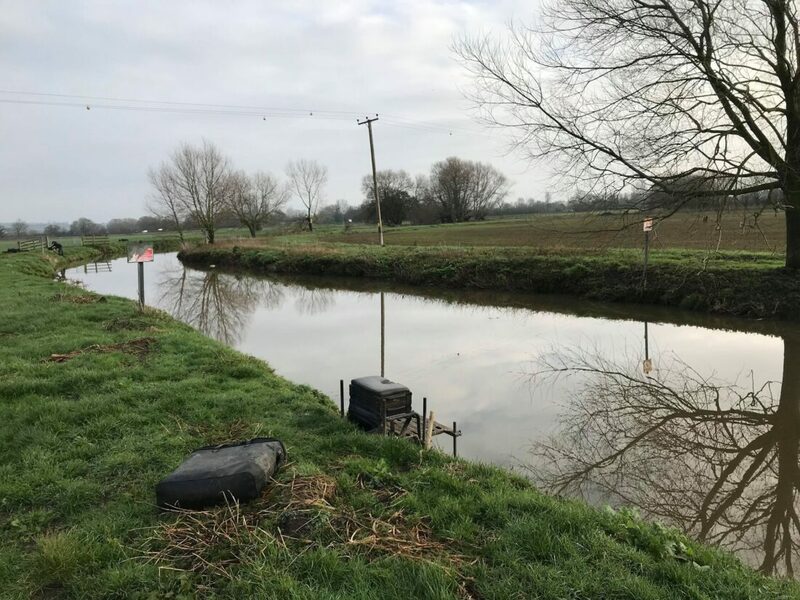 Elsewhere at Isle Brewers, Baz won the section with 6lb 12oz from 128 and then the weights dropped off a bit, Dave P had 2lb 10oz from 124, Rob weighed 2lb 2oz from 129, Adie had 1lb 15oz from 129a and Karl did 1lb 8oz from 123. 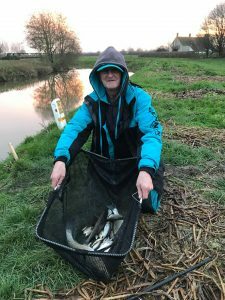 At Hambridge the water was pushing through a tad too much but everybody caught respectable weights, Ben had some nice roach for 5lb 2oz from H5, John weighed 4lb 15oz which included a big chub from H10 and Jake had 3lb from H6. Thanks to Jake Woodard*** for the photos. and then from Gordy on Facebook ‘I see your posts crop up often and I tend not to read them because the language is beyond me when it comes to match fishing and the like. That’s not a knock on your writing, Cuz, it’s just beyond my ken and possibly my Barbie too. I do try and read the more esoteric ones when I can as it’s your passion for fishing that shines through and I remember very well spending all of my school holidays at Perry Street and it’s nice to be able to relate to that. I’m surprised you get negative comments about “the money” and I can’t think why. I play cricket, badly, and there isn’t anyone I know that has a full time job that plays that would ever make any money from it. When you add in the amount of work that goes into getting the games on for the very small amount of people at any club that contribute more than just their match fee, well, it’s certainly not for profit! Even the pros at most clubs get barely enough, probably less, to cover costs of travel, kit and food. Like you said in your article, there’s easier ways to get cash and you’d already be “up” by not fishing matches at all. Thank you so much guys, it means a lot to know people read and enjoy what I do. Previous: Previous post: All about the money? The best flask you can get is one from Stanley. Unbreakable and stay pipping hot for over 24hrs. Keep up the good work and hopefully see you soon. Cheers Steve, I’ve got a Stanley but it’s not great so maybe the seal has gone or something! Hi Jamie, I read your blogs every week, absolutely love them. Just a quick question, on the river matches you fish, do you or any of the other anglers use rod and line, it’s seems that you only fish the pole, why is this? Hi Steve, thanks very much for getting in touch and your great feedback. Regarding your question, yes there are few people that fish rod and line, Terry ‘The Toast’ has been doing really well and fishes the stick float most matches. There are some swims that do lend themselves to rod and line and I’ve had some nice catches fishing a little waggler over the years but like so many these days, I’ve succumbed to poleitis and tend to just fish the pole and I’m sure on occasion it’s cost me when I should have fished rod and line! Hi Jamie just like to say i really enjoy your blog keep up the good work mate.